When you find your courses, take note of the course reference number (CRN). If you have no registration holds, you may register for classes by contacting your advisor or through BOSS. BOSS is the one-stop, online system for access to your university record and where most students conduct business from accepting financial aid to registering for classes, paying their bill, and checking grades. 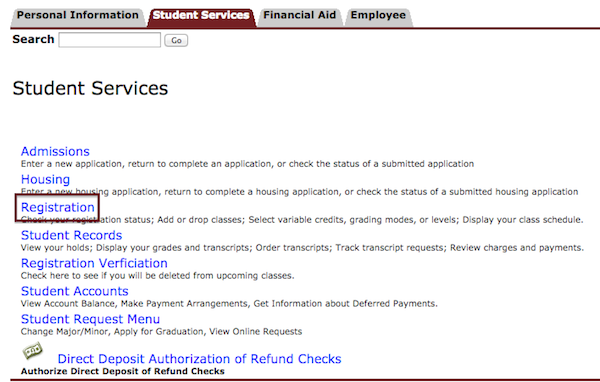 Log in to BOSS at boss.ualr.edu using your student ID, or “T-number”, and pin provided by the Admissions office. Click on the “Student Services” tab, then click the “Registration” link. Select “Register/Search for classes” link, and then determine the course term. Choose your course, then select the section you want to take. The sections available to UA Little Rock Online students will have a “9U_” section number, followed by an “O” for “online campus.” Once you have made your selection, click the “Register” button below the search results. NOTE: Online courses will often post a time of “TBA.” While most fully online courses are asynchronous – meaning that the courses are taken on your schedule – some are synchronous – meaning you will need to meet remotely at specific times. Your instructor will provide information about when assignments are due, when you may expect new material to be posted, and in some cases when you are expected to virtually meet. Contact your instructor and always check your course syllabus so that you’re clear on the expectations for that course.